How to add, remove, and change users on your account. GovTribe is a collaborative platform used by teams of people to research and manage all aspects of the federal contracting business development process. If you have a Standard or Premium subscription to GovTribe, you can invite other users to your account. Doing so allows you to collaborate with them on opportunity pursuits, assign them tasks, and share information with them. All GovTribe Free Trial accounts are on the Standard plan, so even free trial users can invite their colleagues to experience GovTribe. Here is a short video tutorial on adding users to your account. Written instructions with screenshots are provided below. There are two places you can add users to your account. The most obvious is from the header that is always visible on any page on GovTribe. This header shows you all of your account members who are currently online. Just mouse-over the avatars to see the name of the user. To invite a new user, click the blue + User button. It will redirect you to your Account settings page and prompt you to enter the information. You can also go directly to Account Settings in order to view the full list of users on your account. 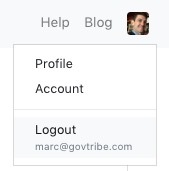 Once you are logged in to GovTribe, go to your account settings by clicking on your avatar photo (or initials, if you haven't set an avatar) in the upper right corner of the screen. On the Account page, scroll down to the section titled Manage Users and click the blue + User button. A pop-up dialog box will appear that allows you to enter in the name and email address of the person you would like to add. Fill in that information and click Invite User. 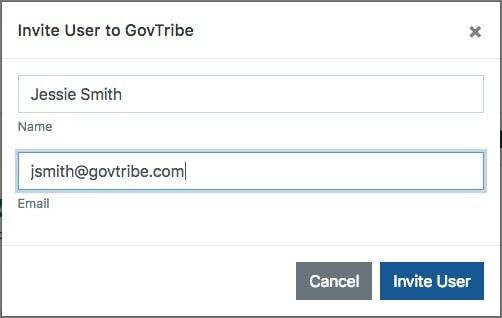 Your colleague will receive an email invitation from GovTribe inviting them to set up their own login, which will be connected to your account. You will see a pending invitation in the Manage Users section of your Account page until your colleague accepts the invitation and sets up their GovTribe login. When the person does accept, the "pending" badge will disappear. When any of the other users on your goes to their own Account page, they will see something like the following. On the Account page, scroll down to the section titled Manage Users. You'll see a list of all of your account members with a red Remove button to the right of their email address. Click the Remove button for any user you wish to remove from the account. Once removed from the account, that user will no longer be covered by your subscription, nor with he or she have access to any of your account content.